Al – Dameer Human Rights Organization issued a Position Paper on Health and Environmental Problems in the Gaza Strip that Lead to an Increase in the Number of Babies Born with Birth Defects, Abortion, and Cancer Diseases. 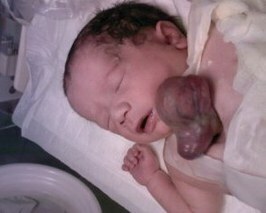 On Sunday, 20 December 2009, Al Dameer Association for Human Rights published a position paper on “Health and Environmental Problems in the Gaza Strip that Lead to an Increase in the Number of Babies Born with Birth Defects, Abortion, and Cancer Diseases Due to the IOF Use to Radioactive and Toxic Materials during its Latest Offensive on the Strip”. The position paper presents the impact of the Israeli Occupation Forces (IOF) use to of internationally prohibited weapons against the civilians of Gaza. As a result, the number of children born with birth defects, abortion, and cancer diseases has increased dramatically since the Israeli operation “Cast Lead” on the Gaza Strip. The disastrous consequences of the three-week conflict continue to affect the lives of the people of Gaza. The illegal use of the chemical weapons in the densely-populated areas would cause a long-lasting tragedy and plague the future generation. The position paper assured that Israel is responsible for an environmental and health disaster in the Gaza Strip. The paper warns about the spike in the number of birth defects in babies born in Gaza following the Israeli offensive on the Strip. Such cases are caused by Israel’s use of illegal munitions against the civilians in the Gaza Strip. That was in addition to the pollution of the environment and its entire components as water, air, and soil, which violates the citizens’ rights to live in a clean and healthy environment. The paper shows an increase in the number of babies born with birth defects after the Israeli war. Some cases where birth defects, such as incomplete hearts and malformations of the brain have started appearing due to Israel’s use of internationally banned weapons during their war against the civilians. During August, September, and October 2008 there were 27 cases compared to 47 cases in 2009. These three months were compared with the same three months in 2009, which shows an increase in birth defects in aborted fetuses and newborns. These births came as an effect of the use of internationally banned weapons by the Israeli occupation particularly, in Jabalya, Biet Lahia, and Biet Hanoun as these areas witnessed the fiercest Israeli aggression. In the position paper summary, Al Dammer considers the IOF use to internationally banned phosphorous shells and dozens of types of weapons that carry toxins has delayed lethal effects , which may appear in the future in the form of malignant and dangerous diseases. The health effects on Palestinians who were targeted in Gaza Strip in the winter of 2008 – 2009 still manifest day by day. There were an increase in cancer disease among children and elderly people, in addition to early abortion and registering many cases that suffer from problems in the respiratory and nervous systems, and it has also its impact on the fertility of men. That was in addition to its disastrous impact on the Palestinian environment and its entire components as air, water, and soil. Al Dameer renews its condemnation to the Continual Israeli closure to all borders and crossings and recommends Immediate and urgent intervention to: ensure Israel’s respect for international humanitarian law and international human rights law, stop the serious deterioration in human dignity inflicted upon the Gaza Strip population, and cease the use of collective punishment policy, including the closure of border crossings. The International Community has failed to ensure respect for international humanitarian law, as no serious measures have been taken towards pressurizing Israel to lift the siege, reopen the Gaza Strip crossings, or allow the entry of fuel, medical equipments and team to face the deteriorated health situation in Gaza. Al Dameer calls upon The Ramallah Ministry of Health and The Ministry of Health (MOH) in Gaza Government to act on their legal and moral responsibilities to save the lives of Palestinian citizens and to protect them from current health disaster. It also calls them to examine and check all the citizens who were near to the Israeli shelling during the offensive in order to prevent them from any dangerous health consequences. Al Dameer demands The Ramallah Ministry of Health and The Ministry of Health (MOH) in Gaza Government to work immediately to find a mechanism to treat the babies born with birth defects outside Gaza, due to the unavailability of the proper and needed treatment. Al Dameer Calls for an immediate investigation by international health experts into the use of unidentified weapons by the IOF against the civilian population of the Gaza Strip. It also Calls for establishing inquiry commissions to investigate crimes committed by IOF against Palestinian civilians, including IOF’s use of internationally prohibited weapons and prepare scientific statistics all over the Gaza Strip to monitor the number of deformed fetus cases due to the IOF use to internationally banned weapons. Al Dameer calls upon the international community to act immediately and to exert pressure on Israel to stop its violations against the Palestinian civilians and environment in the Gaza Strip. Israel denied the entry of delegations and experts into Gaza to examine the environmental and health situation after the latest offensive. As a result, experts should be sent to Gaza to examine the environmental fallout of Israel’s use of illegal weapons in order to prevent the future generations from the unknown coming health and environmental disaster. Experts and international researchers took samples to be tested and make sure that the occupation used internationally prohibited substances in densely populated areas. The results of these samples should be known to all in order to expose the Israeli war crimes in Gaza. Al-Dameer Calls for the prosecution of all political and military officials who are found responsible for committing war crimes against Palestinian civilians. Al Dameer Association for Human Rights calls upon the international community to expose the Israeli war crimes in Gaza, and Calls for prosecuting all political and military officials who are found responsible for committing war crimes against Palestinian civilians, including the IOF use to internationally banned weapons in densely populated areas in the Gaza Strip. On Sunday, 20 December 2009, Al Dameer Association for Human Rights published a position paper on “Health and Environmental Problems in the Gaza Strip that Lead to an Increase in the Number of Babies Born with Birth Defects, Abortion, and Cancer Diseases Due to the IOF Use to Radioactive and Toxic Materials during its Latest Offensive on the Strip”. The position paper presents the impact of the Israeli Occupation Forces (IOF) use to of internationally prohibited weapons against the civilians of Gaza. As a result, the number of children born with birth defects, abortion, and cancer diseases has increased dramatically since the Israeli operation “Cast Lead” on the Gaza Strip. The disastrous consequences of the three-week conflict continue to affect the lives of the people of Gaza. The illegal use of the chemical weapons in the densely-populated areas would cause a long-lasting tragedy and plague the future generation. The paper shows an increase in the number of babies born with birth defects after the Israeli war. Some cases where birth defects, such as incomplete hearts and malformations of the brain have started appearing due to Israel’s use of internationally banned weapons during their war against the civilians. During August, September, and October 2008 there were 27 cases compared to 47 cases in 2009. These three months were compared with the same three months in 2009, which shows an increase in birth defects in aborted fetuses and newborns. These births came as an effect of the use of internationally banned weapons by the Israeli occupation particularly, in Jabalya, Biet Lahia, and Biet Hanoun as these areas witnessed the fiercest Israeli aggression. Al Dameer renews its condemnation to the Continual Israeli closure to all borders and crossings and recommends Immediate and urgent intervention to: ensure Israel’s respect for international humanitarian law and international human rights law, stop the serious deterioration in human dignity inflicted upon the Gaza Strip population, and cease the use of collective punishment policy, including the closure of border crossings. The International Community has failed to ensure respect for international humanitarian law, as no serious measures have been taken towards pressurizing Israel to lift the siege, reopen the Gaza Strip crossings, or allow the entry of fuel, medical equipments and team to face the deteriorated health situation in Gaza. Al Dameer demands The Ramallah Ministry of Health and The Ministry of Health (MOH) in Gaza Government to work immediately to find a mechanism to treat the babies born with birth defects outside Gaza, due to the unavailability of the proper and needed treatment. Al Dameer Calls for an immediate investigation by international health experts into the use of unidentified weapons by the IOF against the civilian population of the Gaza Strip. It also calls for establishing inquiry commissions to investigate crimes committed by IOF against Palestinian civilians, including IOF’s use of internationally prohibited weapons and prepare scientific statistics all over the Gaza Strip to monitor the number of deformed fetus cases due to the IOF use to internationally banned weapons. Experts and international researchers took samples to be tested and make sure that the occupation used internationally prohibited substances in densely populated areas. The results of these samples should be known to all in order to expose the Israeli war crimes in Gaza and Calls for the prosecution of all political and military officials who are found responsible for committing war crimes against Palestinian civilians. prosecuting all political and military officials who are found responsible for committing war crimes against Palestinian civilians, including the IOF use to internationally banned weapons in densely populated areas in the Gaza Strip.